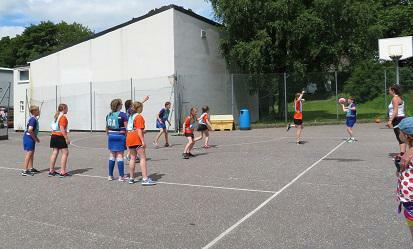 The netball team were in action again in July, we invited Halwill Primary School over for a friendly match. Everyone who attends club from both school had a chance to play in a team, no scores were kept and everyone enjoyed the opportunity to play. 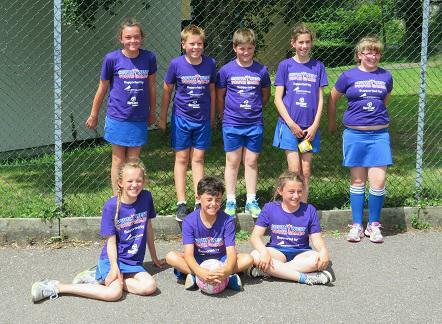 This followed the school team representing North Devon and Torridge at the South West Youth Games in Okehampton. They played fantastically against some very strong opposition, in the morning they only lost one game (against the eventual games winners) which meant they were runners up in their group and went forward to the semi-finals. They played a brilliant game; despite being the only team to score goals against the other team they did not win, this put them into the play-off for the bronze medal position against Torbay. The first half finished with us 4 – 1 down; the second half was amazing and they pulled it back to 4 all by the end of the game. They then went into extra time and put in a valiant effort but Torbay finished 3 -1 up. A final 4th position from the South West is outstanding and we are so proud of them all.